News Maker: Vidya Balan to plane for an engagement with Siddharth Roy Kapoor? Vidya Balan to plane for an engagement with Siddharth Roy Kapoor? Vidya Balan to plane for an engagement with Siddharth Roy Kapoor? 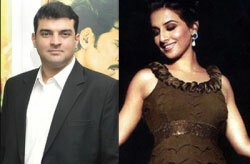 : Vidya Balan and her rumoured boyfriend Siddharth Roy Kapur are said to be thinking of getting engaged. The actress has been spotted with the head honcho of UTV Motion Pictures on more occasion than one, thereby sparking the rumours that something is indeed brewing between them. The latest was their outing together on the sandy beaches of Goa. The duo was clicked in casual beach wear while holidaying together. Apparently, Sid and Vid have been friends for some time since he stays in her neighbourhood. But the couple are wary of being linked together because Siddharth’s divorce from his wife is yet to come through. Naturally, they are likely to play down the reports of their engagement. Vidya’s spokesperson says just because Vidya is friendly with someone doesn’t mean she will get engaged to him. We, however, will wait to see how this ‘love story’ unfolds.